ANY COURSE JUST £19.99 DEPOSIT! Our super-flexible courses make it easy to get the qualifications you need. Access your training materials, practice at your local gym, and take your exams online. Speak to your expert tutor by telephone or email when you need that extra bit of help. With REPs and CIMSPA endorsment, our qualifications are the number one choice. FitLearn is becoming one of the fastest growing training providers in the industry with over 2,500 students worldwide. 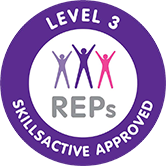 Find out how we deliver our personal training courses and how you can get qualified in 8 weeks! Choose the best package that suits your budget and career goal. The kickstart will get you that first job with a gym-chain, while our ultimate package provides you with all the tools to go from zero-to-hero in a matter of weeks! OUR STUDENTS RATE US AS EXCELLENT!